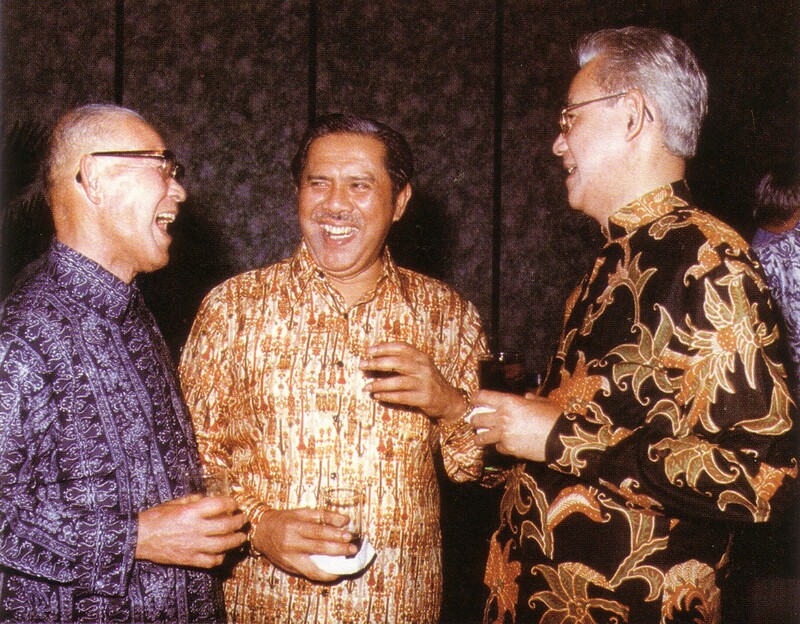 MAJECA and JAMECA were officially launched at a Joint Conference on November 14, 1977 in Kuala Lumpur. Prior to this Joint Conference, two senior representatives of the Japan Chamber of Commerce and Industry (JCCI) visited Kuala Lumpur upon the instructions of Dr. Shigeo Nagano, who was then the President of JCCI and Chairman of the Prime Minister’s Council on Foreign Economic Co-operation. The two emissaries met the Director-General of the Economic Planning Unit (EPU), Prime Minister’s Department and discussed the need to promote a closer economic relationship between the private sectors of Malaysia and Japan. The Japanese Ambassador was also actively involved in the exercise. The Japanese representatives returned to Tokyo with an agreement in principle that closer economic relations between Malaysia and Japan could be promoted by bringing together the private sectors of both countries through an economic forum. This forum would provide a vehicle for forging close and harmonious economic relationships between the two countries and thus translate into practice what the two Governments have been striving to achieve in their bilateral relations. The smiles and the warm handshake of Raja Tun Mohar, President of MAJECA and Mr Masami Ishii, President of JAMECA, at the 9th Joint Conference, symbolized the spirit of friendship and the close and harmonious economic relations between Malaysia and Japan. 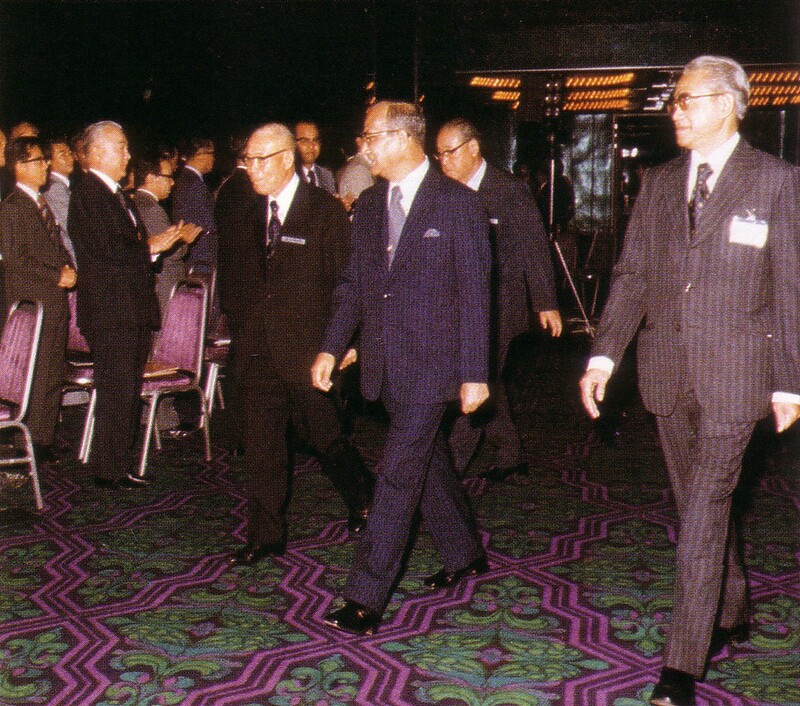 The meeting in Kuala Lumpur between Tan Sri Thong Yaw Hong, the Director-General of EPU, and the two Japanese emissaries paved the way for one of the agreements reached between Mr T. Fukuda, Prime Minister of Japan and Tun Hussein Onn, Prime Minister of Malaysia during the former’s official visit to Malaysia in August 1977. Prior to this official visit, Tun Hussein Onn was briefed by the Director-General of EPU of the visit by the two JCCI officials and of the agreement in principle to set up a private sector forum for the purpose of fostering friendship and promoting close and harmonious economic relations between the two countries. Tun Hussein Onn gave his full support and official blessing to the idea and instructed that the forum should be led by Y.M. Raja Tan Sri Mohar bin Raja Badiozaman, Special Economic Adviser to the Prime Minister. Foreign Minister, Hon. Tengku Ahmad Rithauddeen with Tan Sri Shigeo Nagano, JAMECA President, and Raja Tun Mohar, MAJECA President. Following the official agreement reached between the two Prime Ministers, the Director-General of EPU convened a meeting of a Task Force chaired by Y.M. Raja Tan Sri Mohar. Other members of the Task Force were representatives of the Malay, Chinese and Indian Chambers of Commerce, the Federation of Malaysian Manufacturers, Perbadanan Nasional Berhad (PERNAS), Petroliam Nasional Berhad (PETRONAS), Malaysian Oil Palm Growers’ Council (MOPGC), the Federal Land Development Authority (FELDA) and the Malaysian International Shipping Corporation Berhad (MISC). 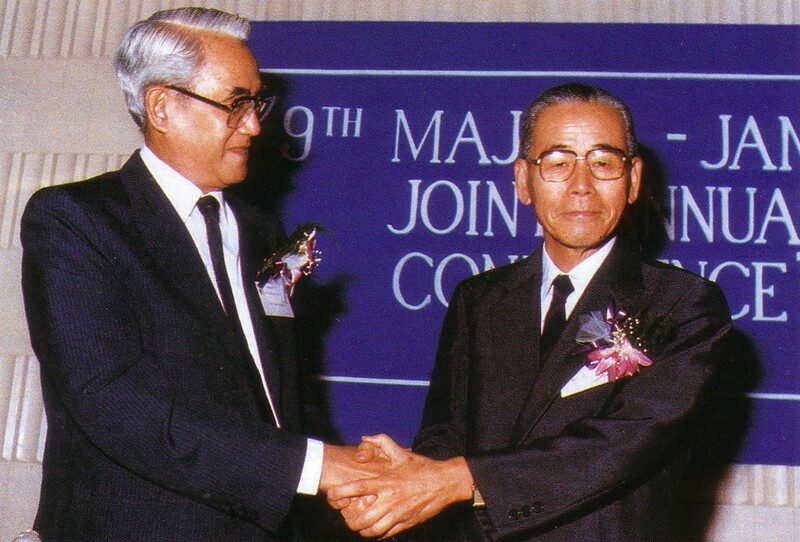 Amongst other matters, the Task Force agreed to the formation of the Malaysia-Japan Economic Association (MAJECA) with its counterpart known as Japan-Malaysia Economic Association (JAMECA), the adoption of MAJECA’s constitution and the appointment of MAJECA’s constitution and the appointment of a Protem Committee. The purpose of the Associations is to promote trade, investment, social and economic co-operation, tourism and all other spheres of economic activity between the private sectors of both countries. 2.1 The Malaysia-Japan Economic Association and the Japan-Malaysia Economic Association shall be organized in Malaysia and Japan, respectively, as organisations for the purpose of liaison and consultation between the private sectors of Malaysia and Japan in all spheres of economic activity to achieve the aforesaid purpose. 2.2 Each Association shall, in general, be composed of organisations and persons in the private sectors engaged in all spheres of economic activity and shall have its own constitution, regulations and by-laws. The number of members and the manner of operating the respective associations shall be prescribed separately in each country. 2.3 While agreeing to work in the closest collaboration and co-operation, each Association shall be independent of each other and be autonomous. 3.1 Free exchange of information regarding trade, investment, social and economic co-operation, tourism and all other spheres of economic activity between the two countries. 3.2 Appropriate representations necessary for promoting economic relations between the two countries to the Government of the country concerned when considered desirable by the Association in that country. 3.3 Exchange of missions consisting of private sectors, groups of industrialists, businessmen, entrepreneurs and technical experts to the benefit of both countries. 3.4 All other relevant activities that may serve the purpose of the Associations. 4.1 The Associations of the two countries shall hold a joint meeting once a year to conduct consultations on various problems pertaining to the promotion of trade, investment, social and economic co-operation, tourism and all other spheres of economic activity between Japan and Malaysia. 4.2 The joint meeting shall be held alternately in both countries. 4.3 Extraordinary meetings may be held when necessary by mutual agreement between the Associations. 4.4 The Associations may set up Joint Working Committees for particular purposes from amongst their members as and when necessary. 5.1 The Joint Meeting shall be composed of representatives to be elected from among the members of each Association. Decisions of the Joint Committee shall be unanimous. 5.2 The Joint Meeting shall have a Chairman, elected from among the representatives of the Host Association, and a Vice-Chairman, elected from among the representatives of the Visiting Association. 5.3 Working groups may be set up when necessary during the Joint Meeting to consider and recommend on individual matters. In such cases, the method of electing a Chairman and a Vice-Chairman shall conform to the procedure in the case of the Joint Meeting. 5.4 The date, duration, and agenda of the Joint Meeting, and other particulars deemed necessary shall be decided in advance by the respective Associations of both countries by mutual agreement.